Joussard volunteers: 1. Lorene Comeau 2. Angelina Couturier 3. Yvonne Chaput 4. Maureen Renneberg. 5. Antoinette Goutier 6. Robert Chaput 7. Neil Renneberg 8. Bill Getz 9. Angela Paul 10. Judy Fortier 11. Jeanette Willier. Dedicated citizens of the region were thanked during local gatherings to celebrate National Volunteer Appreciation Week, April 23-29. Volunteers were recognized in Joussard April 26, Kinuso on April 28, Big Meadow on May 1, and Grouard on May 2. Each gathering was hosted by Big Lakes Family and Community Support Services. “The people invited today have volunteered on boards and organizations and have worked will all age groups to contribute to the health, safety, social life and development of the community,” said Louise Myre, FCSS manager. “I would like to express a heartfelt thank you to all the volunteers who give so much of themselves and expect so very little in return,” she added. Certificates and gifts were presented to volunteers at each gathering. “The work of volunteers is essential to maintaining resilient communities at home and around the world,” Myre said at Kinuso, where volunteer appreciation is held every second year. Enilda – Big Meadow Councillor Ron Matula thanked volunteers in his ward on behalf of Big Lakes County council. “I thank you for being a volunteer to make the community a better place to live,” he added. 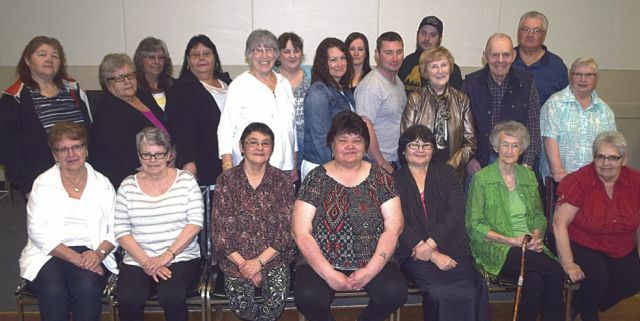 At the Kinuso festivities, FCSS honoured volunteers who serve various organizations including Kinosayo Museum, Kinuso Volunteer Fire Department, Central Slave Lake Agricultural Society, Kinuso Seniors’ Society, Kinuso Girl Guides, Spruce Point Park. At Grouard, volunteers serve the Grouard Seniors’ Club, Grouard Volunteer Fire Department and St. Bernard Church. 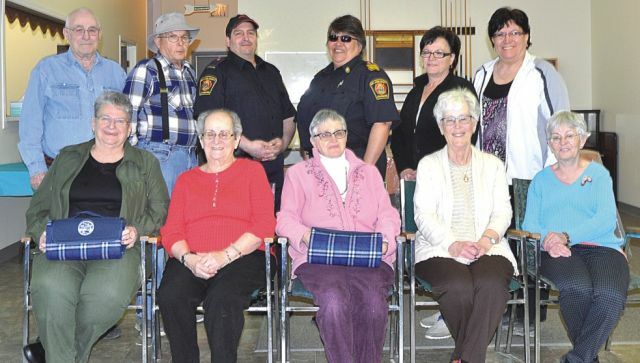 At Big Meadow and Enilda, volunteers were thanked for their contributions to the Enilda Hall, Enilda Volunteer Fire Department and Big Meadow Hall, along with the High Prairie Health Complex and Pleasantview Lodge. 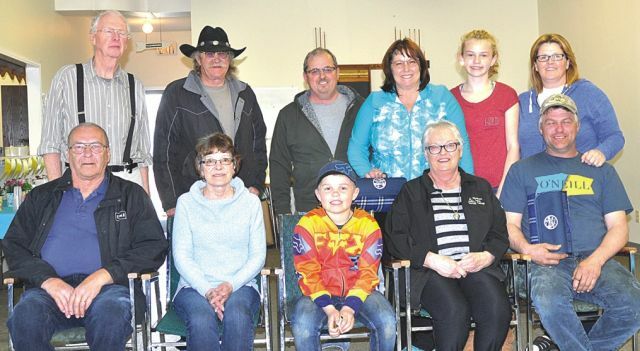 Joussard volunteers were thanked for their efforts in the Joussard Community Association and its events, the Homesteaders Lodge, fire department and others. Joussard volunteers: 1. Larry Samborski 2. Kathy L’Heureux 3. Kruz Marko 4. Maureen Samborski 5. Robin Marko 6. Bernie Faulkner 7. Guy L’Heureux 8. Dave Whillans 9. Brenda Whillans 10. Finn Marco 11. Jenn Marko. Grouard volunteers: 1. Darcy Halcrow 2. Nicole Gladue 3. Linda Van Den Berg 4. Shirley Whitehead 5. Arlette Barrette 6. Gaetanne Beaudoin 7. Roddrick Sutherland 8. David Anderson 9. Father Bill Bernard 10. Sherry Monteith 11. Len Brulotte 12. Kevin Auger 13. Clayton Sutherland 14. Norma Auger. Faust volunteers: 1. Sandy Heroux 2. Stella Baker 3. Lucille Baker 4. Dawn Garrick 5. Donna Dalke 6. Shelly Gladue, with her two children Daryn and Obrey Gladue 7. Patsy Campion 8. Wendy Benson 9. Bryan Heroux 10. Dave Willoughby 11. George Baker 12 Robert Dalke 13. Ken MacEachern 14. Wally Garrick 15. Bert Benson 16. Hallen MacEachern 17. Gary Strang 18. Steve Gladue 19. Cathy Bittman 20. Nancy Sloat. Kinuso volunteers: 1. Diane Doerksen 2. Doreen Beaupre 3. Marilyn Davis 4. Debbie Collins 5. Marilyn Chalifoux 6. Agnes Seppola 7. Josephine Samuelson. 8. Ellie Davis. 9. Donna Holmes 10. Jeanette Rivest 11. Nicole Davis 12. Doris Boisvert 13. Charlene Hunt 14. Nicole Churchill 15. Kim Beaupre 16. Ian Churchill 17. Jay Hollingshead 18. Mona Sloan. 19. Irvin Sloan 20. Ron Beaupre 21. Karen McLaughlin. Kinuso volunteers: 1. Everette Samuelson 2. Nicole Samuelson 3. Marie Francis 4. Ashley Reade 5. Donna Dalke 6. Kieren Moore 7. Ken Sheldon 8. Jim Zinyk 9. Bonnie Francis 10. Holly Malanowich 11. Linda Twin 12. Grant Ferguson 13. Jennifer Moore 14. Verna Hubler 15. Robert Dalke.